sciencecapsules: WHY THE WAVES CAN BE FOCUSSED? WHY THE WAVES CAN BE FOCUSSED? We see parabolic antenna everywhere, in mobile towers, in TV reception at home. Parabolic mirrors are the main component in space telescope. Let us see why they bring rays or waves to focus. 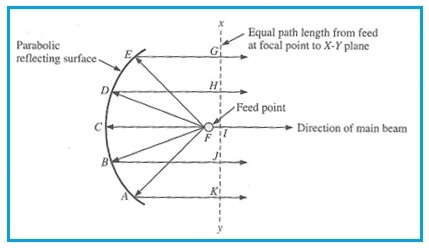 In the above figure, the light rays are reflected by the parabolic mirror and meet at the point F called focus. Light rays are reflected according to the law of reflection. The law of reflection works based on the principle that a wave always takes the path of least time. In the same figure, below the horizontal line, all the rays travel equal distance before meeting at the focus F (1). Also all the rays take equal and least time (2). Only one point F satisfies the above two conditions for all the rays. Hence all the rays ultimately meet at the focus. This is the principle for all the focusing devices and also for all the waves likes electromagnetic waves, heat waves, sound waves and light waves. Ellipse has two focus (rightly named). Take any point on the ellipse. Find the distance between the point and one focus. Also find the distance between the point and another focus. Add the two distances. Repeat this calculation for many points on the ellipse. You can find that the total distance is same and constant for all the points on the ellipse. Suppose you keep a source of light on one focus. 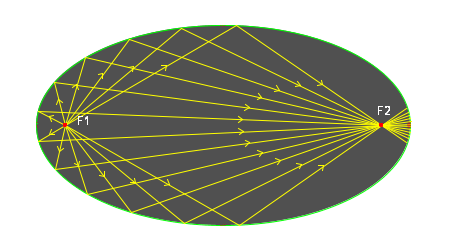 The rays get reflected by the wall of ellipse and coverage on the second focus. It is because, the two conditions are satisfied here also. That is, the distance traveled by all the rays are the same as explained already and all the rays take least and equal time to reach the second focus. This property of the ellipse is used in hospital to focus shock waves and break kidney stones. If a set of parallel light rays pass through a glass lens, they get focused on the other side of the lens. Here the rays travel in air and glass. Lens is a curved one and has a varying thickness. Hence the rays travel different distances inside the lens. Also the rays bend at different angles and take different inclined paths. But all the rays take the same and least time to reach the focus. In the case of lens, the distances traveled are not equal but the time taken is equal. We can define a 'focusing device' as an object which facilitate the light rays to take the least and equal time to reach a point'. Using the above principle, one can experiment to find substitute for the glass lens which has been ruling the optical world for a long time. "Fresnel lens" is a step in this direction-explore. SHIP IS LIGHTER THAN WATER! WHY THE SATELLITES ARE NOT FALLING DOWN ON US? DISORDER IS THE "ORDER OF THE DAY"
WHY JOY-STICK IN THE AIR CRAFT?